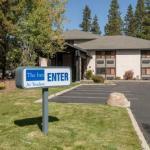 Free breakfast an indoor hot tub and sauna and a pet-friendly attitude make for a cozy base of operations at the pet-friendly and non-smoking Inn at Truckee. This two-story hotel offers 42 rooms with free Wi-Fi mini-fridges cable TV and free local calls. Fuel up with free continental breakfast and come home to a nice soak in the hot tub and sauna. Business services and guest laundry are available. Pets are welcome for a fee. Parking is free. Off I-80 this hotel is within walking distance of several restaurants and stores. Top-notch skiing at the Northstar Tahoe and Squaw Valley are about 25 minutes away. Lake Tahoe with its watersports shopping and dining is about half-an-hour south. Reno/Tahoe International Airport 37 miles north.